Pleased with the effort, I pulled into the parking lot at Beat's office and hid in the only patch of 5 p.m. shade, next to a malodorous dumpster. "Bring on hibernation season," I thought. Recent bouts of moodiness and rough breathing convinced me it was time to embrace the slump and take it easy for a while. High temperatures / pollen / wildfire smoke / more reasons not to venture outside just cemented the excuse. But then Beat wanted to do another after-work car swap on Thursday. 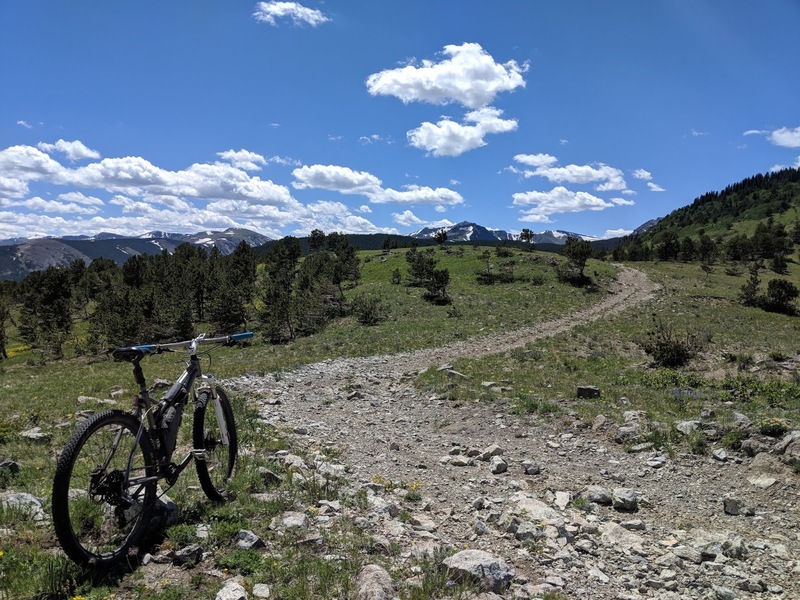 The temperature at 1 p.m. was 95 degrees, and I decided if I was going to punish myself, I was really going to punish myself, via Winiger Ridge and the East Mag Dots. Yes, it must be obvious by now — I am not an avid trail rider. 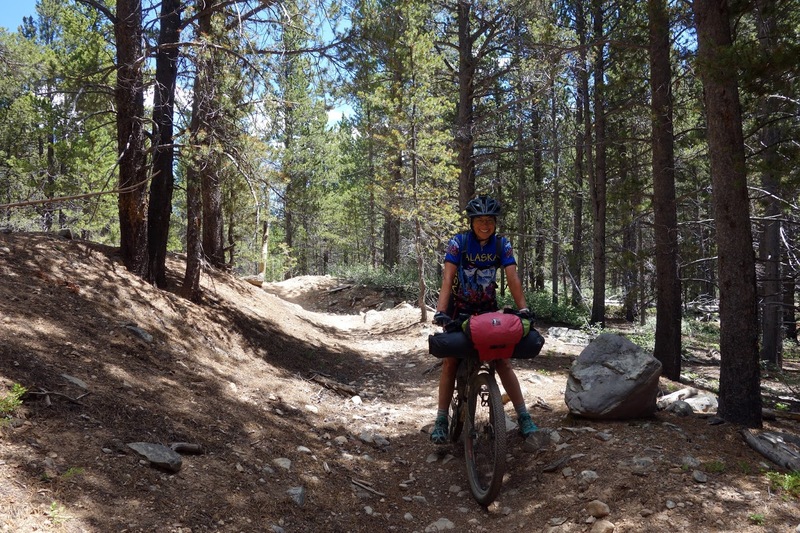 Around here, bike-legal singletrack is limited and largely full of rocks. At some point, I decided that I do not need to take a beating from my bicycle to prove I like to have fun. I'm nearly 40 years old and fine with my true identity as a fireroad-climb-loving fun hater. The initial hike-a-bike up Winiger began after an hour of steep climbing on washboard gravel and hot pavement, followed by rutted jeep roads. Before I even crossed the gate onto the punishing trail, my neck and arms were already coated in dozens of drowned gnats. Sweat streamed down my forehead into my eyes; I hadn't been able to open the left one for at least twenty minutes. My temple was throbbing ... no doubt an early symptom of heat exhaustion. The maniacal laughter in my head was probably another symptom. This was brutal. Ha ha ha! I bounced along the rock-strewn ridge, stopping frequently to admire wildflowers and catch my ragged breath, then crossed onto the Dot trails. This trail system, like most trail systems, is a hopeless maze that often leaves me disoriented and lost even when I'm not heat-addled. Unintentionally I ventured onto an unsanctioned social trail that became progressively more overgrown, until finally I faltered on rocks hidden in the grass and toppled over, jamming my thumb. Ugh. Grumble, grumble. Eventually I bashed my way out of the hidden forest and realized I'd forgotten my phone, so I had to race home before riding into town. 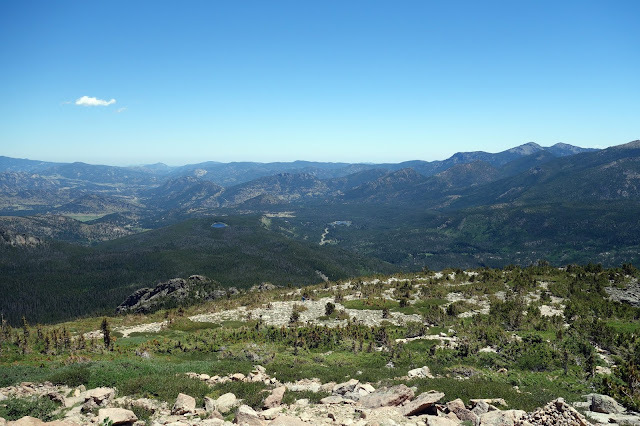 Head throbbing, lungs searing, thumb sore, dizzy near the top of each climb ... and yet, my weird body perversely rewarded me with exhilaration and satisfaction. Just another reminder that it is more "fun" to do hard things than it is to complacently coast through my comfort zone. I caught up with Corrine on the Gold Dust Trail, just as I was wheezing my way up a steep pitch near 11,000 feet, and she was creeping down on her loaded bike. She stopped to cheerlead my climb, calling out "Yeah! You got this!" and waving her warms. She didn't recognize me until several seconds after I stopped next to her. So that whole time, she paused her own racing effort to offer enthusiastic encouragement to someone she thought was a random stranger. That's Corrine. It warmed my heart, even if it did take a little bit of the wind out of my sails, since I had intended to stop somewhere along the trail and cheer for her. 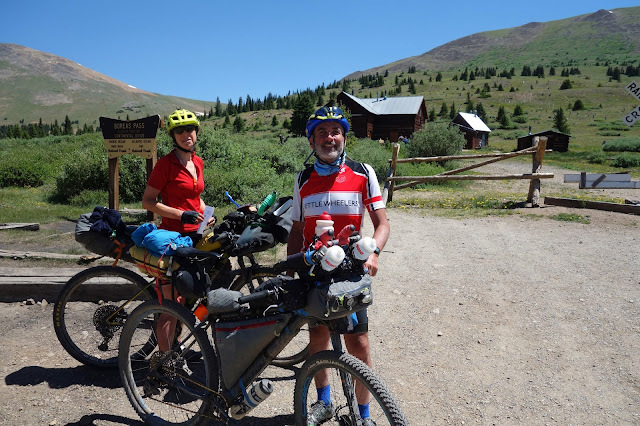 With a promise to catch her once more so we could enjoy a short break in the hot sun, I continued up to the pass and met Phillipa and Chris, two friends from the U.K. who are also riding the Tour Divide. After brief introductions Chris asked me, "Oh, did you do the race?" "Yeah," I replied, "in 2009 and in ..."
"Beautiful course. I've ridden the TMB," he cut in. That's when I realized he was talking about UTMB. I'd forgotten I was wearing a UTMB shirt. "Oh yeah," I said, blushing, hoping the conversation wouldn't veer to my embarrassing Alpine racing odyssey. "I raced in, uh, (looking down at my shirt) 2012." "That's a tough go," Chris said. "I'm always impressed with you runners." "Yeah, well, it's not a run for most of us," I mumbled. "More like a trudge." I followed Chris and Phillipa down the Gold Dust Trail, where they promptly buried me in the fine, not-so-gold dust. I suppose anyone who can ride the Tour du Mont Blanc trails must be a fairly proficient technical rider, so I wasn't surprised, even if they were riding loaded bikes and 21 days of fatigue. I did see them one more time, as they took a wrong turn off the trail and spent 20 minutes retracing their enthusiastic descent. I caught Corrine once more near the bottom of the trail. We ate snacks from our own stashes (no support here, no worries) and chatted too much about me (Corrine is a physician and always asks me questions about my health, which is appreciated, even when I'd rather hear her stories.) With an enthusiastic wave, she continued south into Como. She had a rough go early in the race, but seems to have found a rhythm, even though "every day is hard." It was fun to see her in the midst of such a significant adventure, in good spirits. Propelled by Tour Divide stoke, I turned and continued back up Boreas Pass, then descended a jeep road / stream bed into Breckenridge. 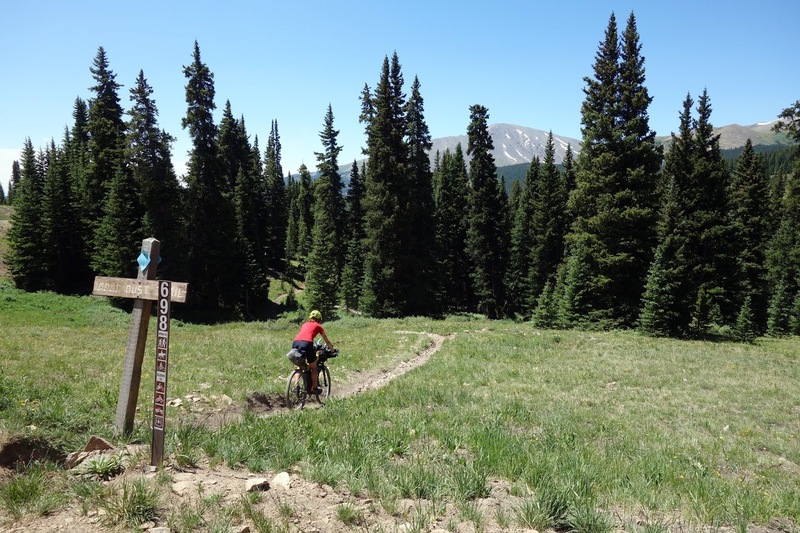 The final climb on the Great Divide Mountain Bike Route back to Boreas Pass was full of happy nostalgia. 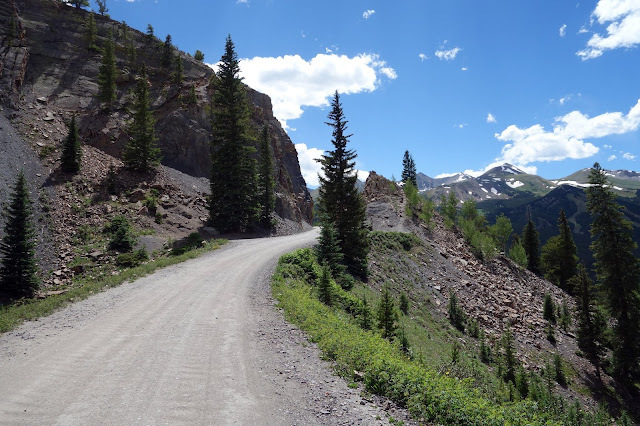 I remembered the last time I rode along this road, while visiting our friend Daniel in Frisco in 2012. I borrowed Daniel's rickety old hardtail and pedaled up the pass to cheer for another Tour Divide rider ... I forget her name after all these years. Tracy, perhaps? She had fallen far off the back of the pack, and was lonely and struggling, but determined to finish. After Tracy and I chatted briefly on that cold, rainy July afternoon, I felt so inspired by her determination and the mountain scenery that I decided yes, definitely, I would return to ride the Divide someday. 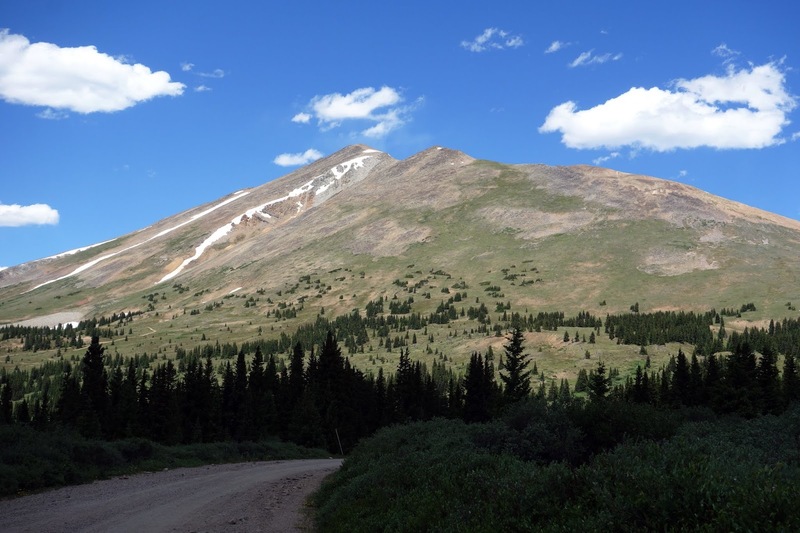 I wasn't able to climb Boreas Pass when I made that return in 2015. I quit the race just before this point, wracked with pneumonia and too many bad memories. 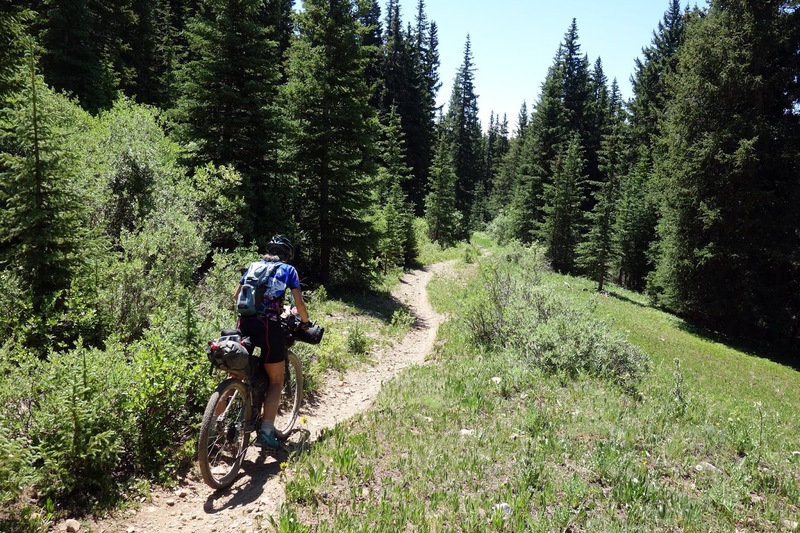 I still wonder what the Tour Divide is to me, exactly. But it's simple, on a beautiful afternoon after another three years have passed, to promise myself that yes — I will return to ride the Divide someday. 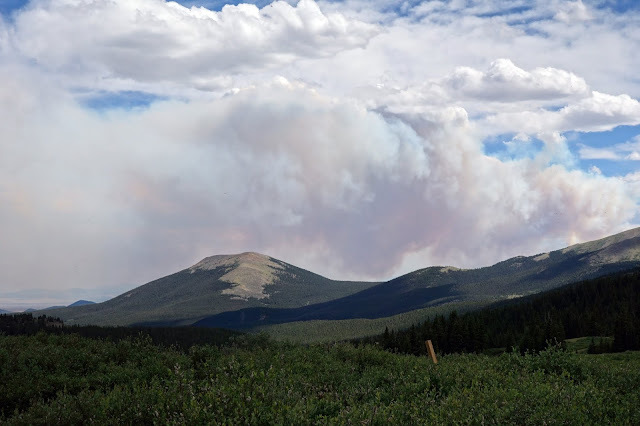 Just over the pass, the sky was filled with a billowing plume from the Weston Pass fire, which erupted just hours earlier and had already grown to several hundred acres. Smoke was spreading so rapidly that I became convinced the fire was just over those mountains, and would move through and consume my car before I could get back to it. In reality the fire was more than a dozen miles away, but the proximity of all of these fires is disconcertingly close to home. This could be a tourism slogan for the state: See Colorado, before it burns. Beat and I have been laboring at our own fire-mitigation project — brush and branch removal near our house. We've hauled at least twenty truckloads of debris up steep slopes, and the effort has proved to be a serious strength workout. This consumed our Saturday in what was hardly a rest day, and then our friend Eric — Corrine's husband, who is road-tripping down the Rocky Mountains while she labors on her bike — dropped by for a visit. 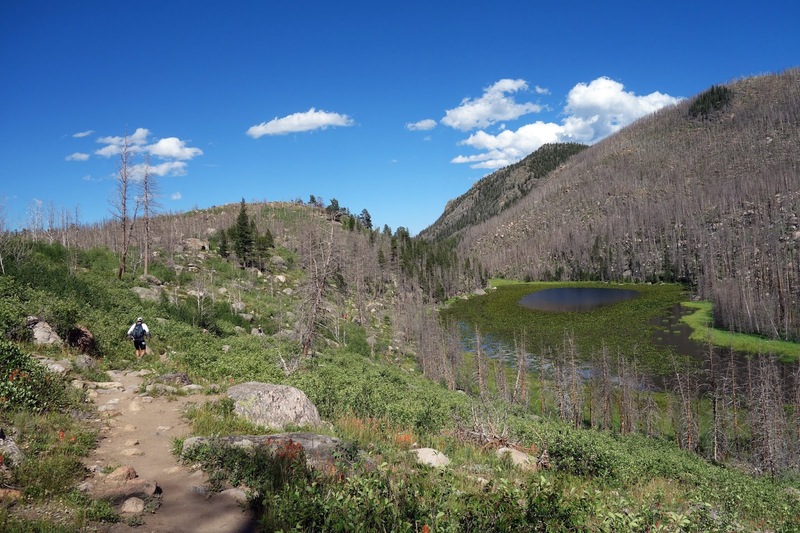 On Sunday, the three of us headed into Rocky Mountain National Park for a trail hike/jog. Eric — who has lived in underpopulated Alaska all of his life — got a kick out of the Sunday traffic heading into Estes Park, and took photos of the three-quarter-mile-long lineup at the park entrance while Beat and I grumbled. 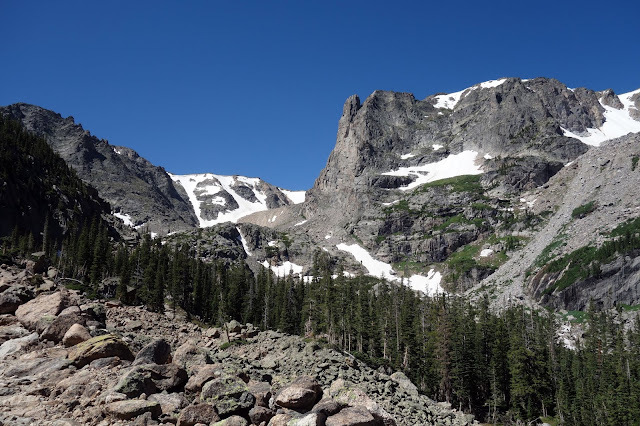 Of course the reason RMNP is so popular is because it really is an incredible place (and also well-developed and conveniently close to the Front Range.) Beat and I agree that we don't take enough advantage of the close-to-home adventure potential here. Luckily we picked a more obscure trailhead within the park to start our outing — a long loop to Hallet Peak at 24 miles with 6,000+ feet of climbing. 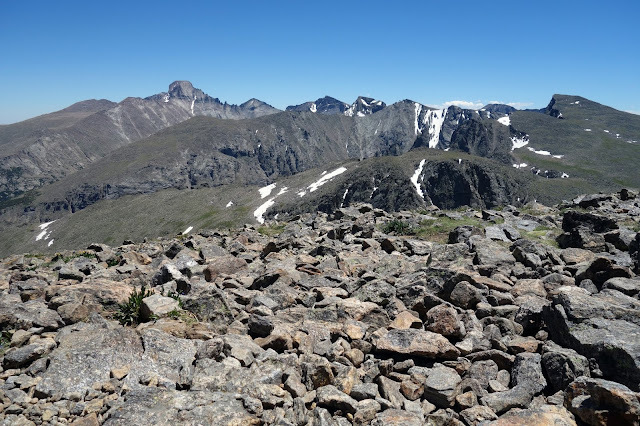 Eric decided to do a slightly shorter out-and-back to Flattop. My breathing was rough from the start — whether caused by hard efforts during the week while breathing pollen and smoke, or simply the timing in my health pattern, I don't know — but the first miles were a struggle. When Beat informed me we were only at 8,000 feet and I was already gasping, I urged him to go ahead while I tried to capture better rhythm. 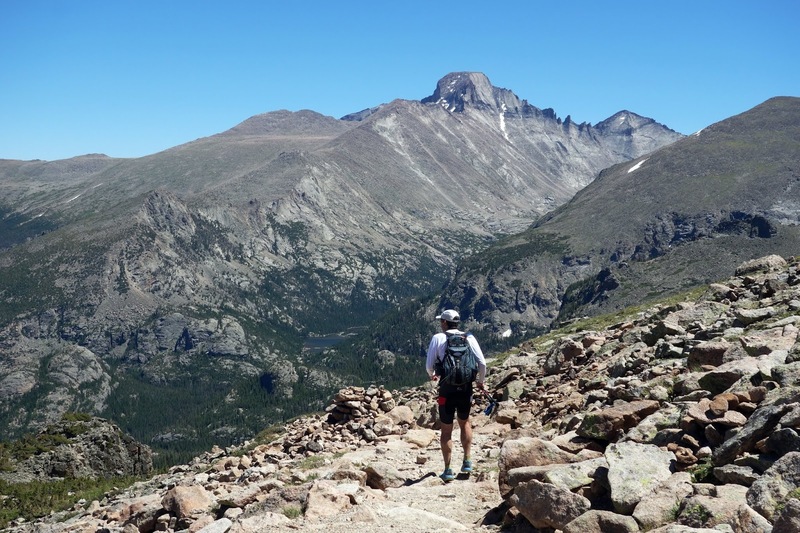 As I stumbled along the rocks, I stewed over a conviction that I will never have "normal" fitness — just good weeks and bad at inconvenient intervals, independent of training, medication, or anything else I can control. Then, after a number of miles had passed and the altitude soared, my breathing randomly improved. I switched to positive thinking about undulating toward balance ... or, even if this pattern continues, it doesn't really matter. I can still get outdoors for beautiful outings, regardless. 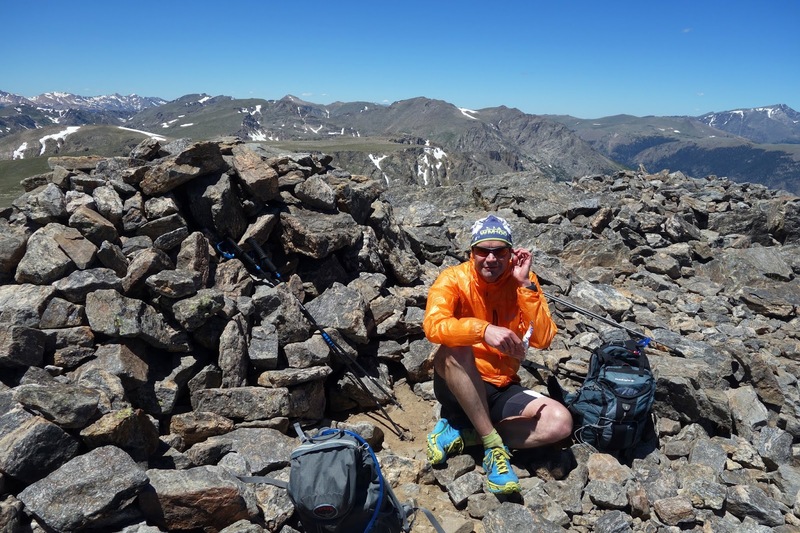 By the time I rose above treeline near 12,000 feet, my breathing had strengthened enough to manage lung-emptying blasts from an intense headwind. It was quite incredible, this wind, with 50+ -mph gusts that reverse-thrusted my body to a complete stall and drove a bone-piercing chill on a hot summer day. 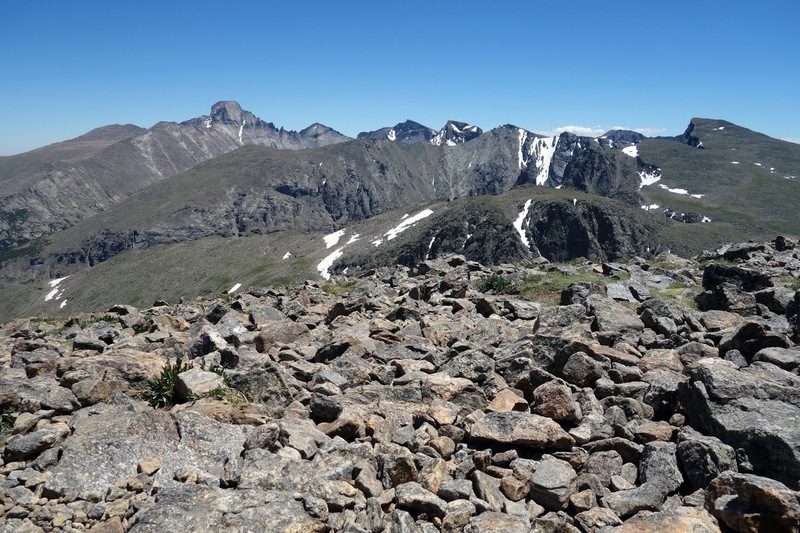 I stumbled along the rocks, struggling to maintain upright balance as Beat came down from Hallet Peak. 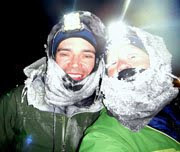 He agreed to endure double-time in the wind to climb the mountain one more time with me. Beat is such a sweetheart. We hid in the windbreak on the summit, just long enough to enjoy a sandwich and views on a mountain we had all to ourselves. Battling our way back to Flattop. Not pictured: 50mph winds. 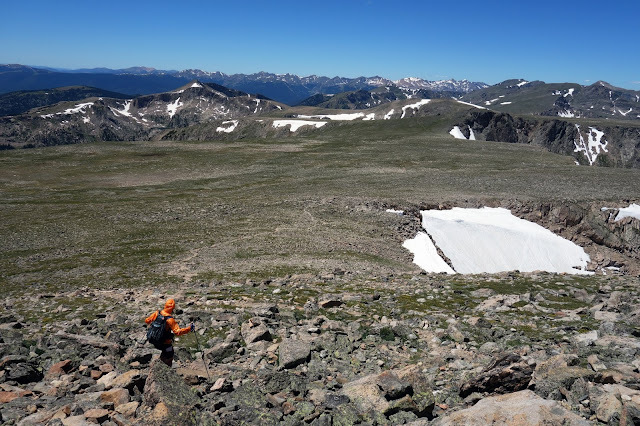 The wind calmed and the heat cranked up as we descended. I felt continually better as we went and made a determined effort to keep up with Beat, with marginal success. When I start an effort with shallow breathing, it usually stays that way or worsens. So this was encouraging, if perplexing. What should I even do with this unruly body? I don't know the correct answer, but I do know that hibernation is not a real option. For me the June pollen/asthma seems similar -- if it's bad at the start of a run, it's very unlikely to get much better (even 6 hours later...). I can fight through it, but I'm not so sure it's always worth it. Riding bikes gives better breathing, for sure. Interestingly the yellow clouds are done (I can shake the trees and no visible pollen comes out) but I still can't breathe as normal. Come on rain! 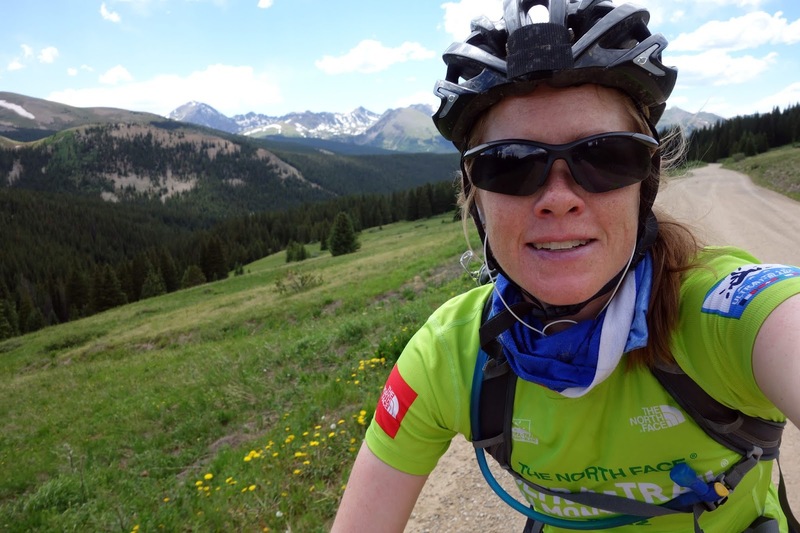 "I'm nearly 40 years old and fine with my true identity as a fireroad-climb-loving fun hater." I think one of the best things about being 40ish is how true this statement is in general, even leaving out the fireroad part.
" 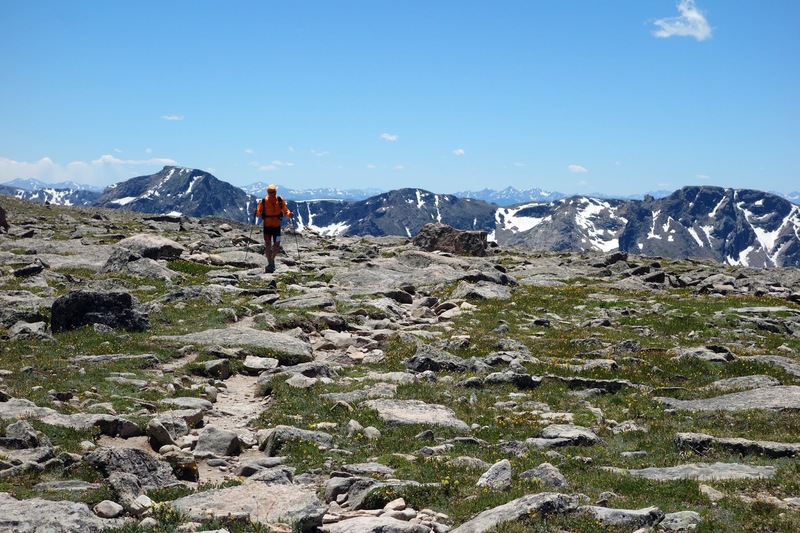 I can still get outdoors for beautiful outings, regardless." One editorial correction: "underpopulated Alaska" should read "properly populated Alaska"!